The move to a new building is a fact. The move is necessary to meet the growing demand for Dino Stretch Hood and various pallet transport modules. The new company building has an appropriate appearance. This offers us the opportunity to demonstrate our products and ambitions in matching way. A roll cage has sufficient stability, but the linen in the roll cage must be water and dust resistant. Despite the high output of 100 roll cages per hour, foil consumption has always been a reason not to automate. 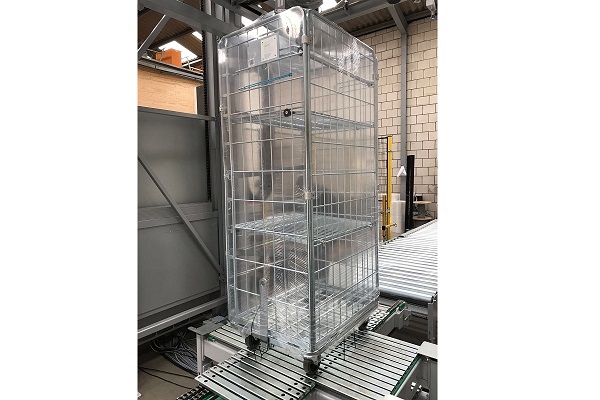 With the availability of 20-micron stretch hood film and Dino Stretch Hood handling this type of film our customer is investing in automating the packing process. • Saving on labour cost. Interpack 2017 has noticed Dino Stretch Hood FLEX. Through our partner Qimarox, Dino Stretch Hood has become world-renowned for Europe’s largest packaging fair. The design and simplicity of the FLEX system has been received with lots of great interest. The possibilities to extend the basic Dino FLEX with modules provides options to comply to project specific requests. Preventing one-off developments, which reduces the user’s risks and keeps the investment level very favourable.